Install AndroidX86 into VirtualBox. Most students will perform this task in Windows, then use VirtualBox to run AndroidX86 on your Windows desktop. Download Pristine Android from the link below. This is an OVA file. I also provide a link to an ISO if you want to play with that for a bit, but I recommend the OVA. The download is fairly large, so Google might want you to click on various buttons or links for a bit. Just forge ahead and click away until something finally downloads. After downloading the OVA, you can double click it to launch it in VirtualBox. Or, if you prefer, choose File | Import Appliance and browse for your OVA file. It is probably best if you ask the system to reinitialize the MAC address, but this doesn't seem to be a necessity. 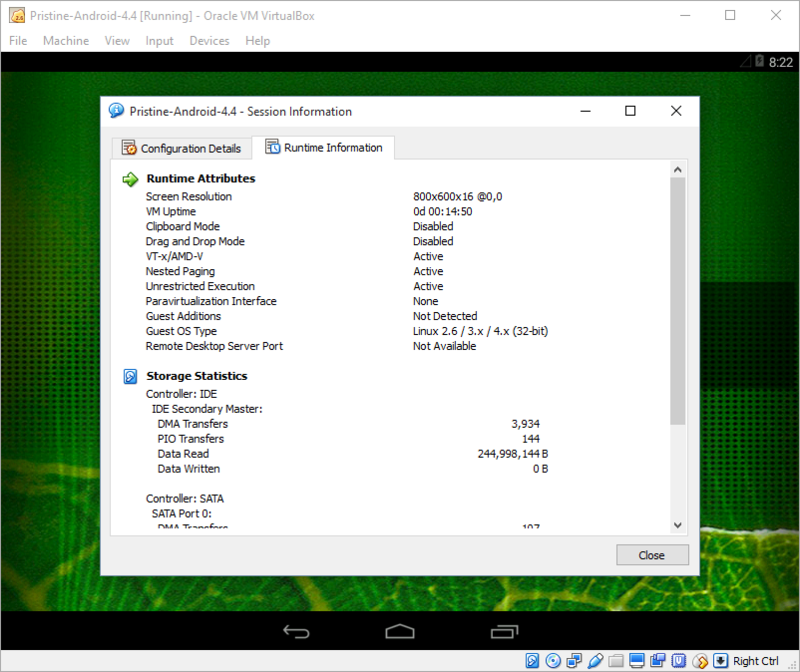 Start the Android X86 VM by pressing the green run button in VirtualBox. After Android X86 boots, get started by making sure that Input | Mouse Integration is turned off. Click on the screen and turn off the option that keeps showing the same warning over and over. Your mouse will now be trapped inside AndroidX86, which is what you want. To release it, press the Right Control key. Skip the Wi-Fi setup. Select any options necessary to convince Google that you really want to skip it. Sign in to your Google Account, and again clicking anything necessary to convince Google you really want to sign in. After you are signed in, click as many blue buttons as you can find until Google finally lets you get some work done. Click the grid at the bottom of the Android X86 screen to view the Apps. Select terminal emulator. On the top right is a menu. Use it to set the font to something much bigger than 10 PX. Type netcfg and note your IP address. At some point, the screen might time out and go completely black. To fix that, choose the Context Menu Button on your keyboard. It is usually to the left of your Right CTRL button. Android home screen running on your desktop. Let's skip the Google Drive and Google Docs shared document part of this assignment. Just getting AndroidX86 installed will be enough for now. As always, choose Settings | System | Acceleration and confirm that VT-x | AMD-V is selected. You can confirm this at run time by selecting Machine | System Info. If you don't have virtualization help from the processor then your VM will either be very slow, or not work at all.